2 Mil of Ultra Violet stabilized Chrome subsurface metalized on one side. Ultra Violet stabilization adds 6 to 18 months longer extended durability than most competitors. 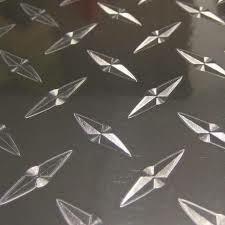 Higher luster and light reflectivity achieved by utilizing ultra high clarity polyester not normally used outside highly critical applications. Tape Technologies higher temperature resistance polyester and almost nonexistent shrinkage makes it ideal for high temperature applications. A unique high temperature acrylic adhesive also adds to the products' high performance. The release paper is balance formulated to the adhesive for best cutting and weeding. For samples of our metalized films, please contact us. Face Film: 2 mil polyester films, metalized so the color shows through with the polyester surface. Adhesive: 1 mil clear, permanent acrylic based pressure sensitive adhesive which allows bonding to a smooth, clean, wax-free surface. Release Liner: 78 lb. 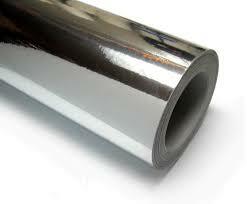 silicon release liner protects the adhesive prior to application allowing the film to remain flat in sheet or roll form. PEEL ADHESIVE VALUES: 30 min. 72 hrs. 180º Peel Values: 3.5#/in. 4.5#/in. Shear Adhesion: 1000 gram/1" wide. Opacity: These films will completely hide black legend upon application. Expected Lifetime: Two years for bright silver. Gold is not recommended for exterior applications. Storage Stability: Shelf life is one year when stored under 70º F and 50% relative humidity. All information based on tests believed to be reliable. These values do not constitute guaranty and do not constitute a warranty. Purchaser is to independently determine suitability of this material for specific purpose.